Did you know that the Bible contains "bad news" and "good news"? The "bad news" is about us—what we are like. The "good news" is about God—what He is like and what He has done for us. The "bad news" is that we have sin in our hearts. In our last lesson we learned that every person is born with sin in their heart. Have you ever told a lie? Have you ever disobeyed your parents? Have you ever taken anything that did not belong to you? Have you ever hated someone? Have you ever said bad words? We do these things because we have sin in our hearts. The "good news" is that God gave His Son to us to be our Savior. 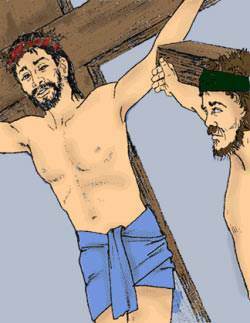 The Lord Jesus died on the cross to take the punishment for our sins. But Jesus did not stay dead. He rose again on the third day. He rose to be our living Savior and our special Best Friend! When we take God's Son, the Lord Jesus, as our Savior, God forgives us of all our sins and makes us His child forever. That is really good news! "I Have Been Trying to be a Christian." Jonathan had a worried look on his face as he came up to his Bible teacher after class. He said, "I have been trying and trying to be a Christian, but I just cannot be one." "Why do you say that you cannot be a Christian, Jonathan?" asked the teacher. "Because I do bad things," said Jonathan, as he hung his head. 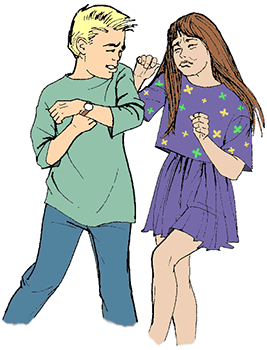 "Jonathan," said the teacher, "you do not become a Christian by trying to be one. You become a Christian by taking the Lord Jesus as your Savior. When Jesus comes to live in us, He gives us the power to stop sinning." This was really good news to Jonathan. He prayed and asked the Lord Jesus to come into his heart. Because God loves us so much, He gave us the greatest gift He could ever give to us. He gave His Son to us to be our Savior. The Bible says, "…the Father sent the Son to be the Savior of the world" (1 John 4:14). The Lord Jesus was born in Bethlehem. Jesus had a mother just like any other baby, but He did not have a human father as you and I have. Who was His father? God was His Father! Jesus came into the world as a tiny baby, but He was different from us because He did not have sin in His heart. He is the sinless Son of God! Have you ever wondered how Jesus got His name? God gave it to Him! The name "Jesus" means "Savior." Jesus is the One who saves us from our sins. God said, "You shall call His name JESUS: for He shall save His people from their sins" (Matthew 1:21). When Jesus became a man, He began to preach and teach. One day John the Baptist saw Jesus. 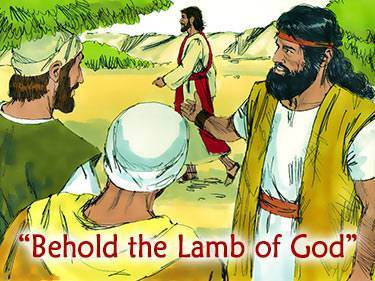 John said, "Behold the Lamb of God, which takes away the sin of the world" (John 1:29). John called Jesus "the Lamb of God" because Jesus was going to die for the sins of the world. Jesus is the only One who could die for our sins because He is the Son of God. He never sinned. He was pure and holy. That is why He was able to take the punishment for our sins. Now we come to the saddest but most wonderful event that ever took place in this world—the time when Jesus suffered and died on the cross for our sins. Men did not take Jesus' life from Him. He chose to lay it down for us. He said, "Therefore does My Father love Me, because I lay down My life…No man takes it from Me, but I lay it down of Myself" (John 10:17-18). Jesus was taken to the Roman governor, Pontius Pilate. Pilate told the soldiers to take Jesus out and whip Him. He was beaten terribly. Some people pulled the hair from His face. Some placed a blindfold over His eyes and took turns hitting Him in the face with sticks. Some even spit in His face and made fun of Him. 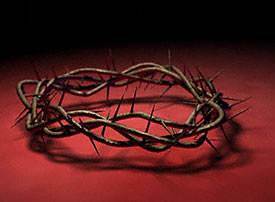 They made a crown for Jesus—not a crown of gold, but a crown of thorns. Then they took Him to a place called Calvary and crucified Him. This means that His hands and feet were nailed to the cross. Two thieves were crucified at the same time, one on each side of Jesus. These two men had done a lot of bad things. But Jesus had never done anything wrong. Jesus, the Son of God, was dying for our sins. As Jesus hung on the cross, He could see the people who had beaten Him. He could see the ones who had nailed Him to the cross. He looked toward Heaven and prayed, "Father, forgive them; for they know not what they do" (Luke 23:34). Jesus prayed for His enemies. He wanted them to be saved. One of the thieves who was crucified with Jesus was saved because he took the Lord Jesus as his Savior. He said, "Lord, remember me when You come into Your kingdom." Jesus said to him, "Today you shall be with Me in paradise" (Luke 23:43). The other thief would have been saved too if he had taken the Lord Jesus as his Savior. Jesus loved him and wanted to be his Savior, but he did not believe on Jesus. He was not saved. He did not go to Heaven. Why did God's Son die on the cross? Jesus died so we could be forgiven of all our sins. Jesus is the Son of God. He never committed a single sin in His whole life, but He took the punishment for my sins and your sins. God took all my sins, all your sins, and the sins of all people and laid them on His Son. 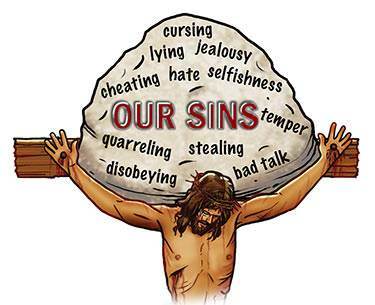 All of my lies, my disobedience, my bad talk, my selfishness, my bad temper, all my sins were laid on Jesus. The Bible says, "…the Lord has laid on Him [Jesus] the iniquity [sins] of us all" (Isaiah 53:6). Think of God's Son dying on a cross like a criminal! Why did He do it? He did it because He loved us. We have learned a wonderful truth: Jesus Christ, the Son of God, died for our sins. It is even more wonderful when you say, "Jesus Christ, the Son of God, died for MY sins!" Will you say this to yourself right now? All my sins were on Jesus when He hung on the cross, but when He rose from the grave, they were all gone. What happened to my sins? God blotted them out. He erased them. They are gone forever! God says that He will not even remember them. In His Word, He says, "Their sins and iniquities will I remember no more" (Hebrews 10:17). Would you like to thank the Lord Jesus for dying for your sins? You can do this right now. Just tell Him, "Lord Jesus, I do thank You for loving me so much that You died for my sins. I want You to be my Savior and my special Best Friend." Maria told a lie so she could get to see her grandmother. Then she got her friend Susan involved in her lie. Maria's visit with her grandmother ends just as she was about to find out why people lie and do bad things. "Maria and I have not seen each other in a long time," Grandmother told Miss Wilson. "It was my fault for keeping her here. Please don't punish her for it." "Well, we will see," Miss Wilson answered in an irritated huff. On the way home in the bus, Maria felt disappointed. If only her grandmother could have finished explaining things to her. "I am just like Adam and Eve. I wanted my own way," Maria told herself. Every day she felt worse inside. "Who could explain things like Grandma?" Maria wondered. The next morning Maria went out to the back yard where Steven was playing with Captain. "Steven," she asked, "would you like to go to Sunday School tomorrow?" Steven tossed the ball toward the eager puppy and watched him scamper after it. Then he said, "Sure! I would like to go and find out if that book in Heaven you talk about is true." "It is," Maria said. "Just ask the teacher tomorrow. Come and help me phone Anna. We will ask if Uncle Jim can pick us up." As soon as Anna heard what they wanted, she called her father to the phone. Uncle Jim sounded pleased. He promised to come pick them up and take them home after lunch. When their mother came home, Maria and Steven asked her if they could go to church and Sunday School. "Oh, I don't care," she said with a shrug. "But you will have to get yourselves ready. And do not make any noise. Your father and I are going out tonight and we will want to sleep late tomorrow." 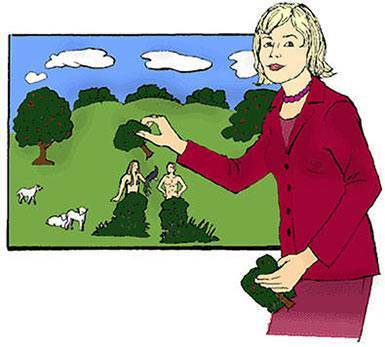 In Sunday School the next day, Maria watched closely as the teacher put pictures of Adam and Eve on a flannel board. The teacher began by reviewing previous lessons taught in the class. "Adam and Eve sinned, you remember. And they passed their sinful natures on to us. We are all born with sin in our hearts. That is why we do wrong things and say bad things. We all want our own way. God has told us that no sin can enter Heaven." Maria was amazed that she was hearing what her grandmother had started to tell her on Friday. Maybe her teacher could answer her questions. Maria raised her hand. "How can anyone ever get to Heaven? How can our names be written in Jesus' beautiful book?" she asked with a troubled face. The teacher smiled as she answered, "Maria, God loved us too much to leave us in our sins and unhappiness. He sent His Son, the Lord Jesus, to take the punishment for our sins." She put a picture of the cross on the flannel board and continued. "The soldiers took Jesus and whipped Him. They put a crown of thorns on His head. Then they nailed Him to the cross where He died. He died for your sins and for mine. This is how Jesus saves us from our sins, just like the Bible says in Matthew 1:21." "Do you mean that Jesus took the punishment for things we do, like telling lies and disobeying?" Maria asked. "Yes, dear," the teacher answered. "God took all the bad things we have done and He laid them on Jesus. Now we need to believe that Jesus died for our sins and receive Him as our Savior. The moment we do that, God forgives us of all our sins. The Bible says in Acts 16:31, 'Believe on the Lord Jesus Christ, and you shall be saved'." At last Maria understood. "I want to do that," she said. There was delight in the teacher's face as she said to the class, "Maria, you can do that right now. Any of you children can receive Jesus right now. Let us all close our eyes." Then she said to Maria, "Now, Maria, you pray and tell Jesus that you believe He died for you. Tell Him you are sorry for your sins. Ask Him to come into your heart and be your Savior." The other children were very still as Maria prayed. The teacher prayed and the class was dismissed. As Maria was leaving, the teacher put her arm around her and said, "I hope you will come to Sunday School every week, Maria. And remember you can take all of your troubles to Jesus now." "Is my name written in the beautiful book in Heaven now?" Maria asked. "Yes, Maria, your name is written in Jesus' beautiful book." The teacher nodded her head and gave her a warm smile as she said goodbye. Maria's eyes sparkled as she and Steven left the church that morning. On their way home in the car that afternoon, Maria leaned close to Steven. "I have some wonderful news! I belong to Jesus now," she whispered. "And my name is written on the list in Jesus' beautiful book." "WOW!" Steven exclaimed. "Our teacher told me all that you said was true. He told us a lot of other good things too. If Uncle Jim will take us, I want to go back next Sunday." "Me, too" Maria said. "Now, Jesus will help me do the right things I need to do." At school the next day, Maria knew she would have to tell Miss Wilson about the lie and the torn list. "And I will have to tell her how I got Susan to lie, too," she thought, feeling scared. Then she remembered that Jesus would help her and she began to feel better. Just before the last bell rang Miss Wilson said, "Some friends of mine are offering a free week of camp to five students who make the most improvements during the rest of this year. You will be chosen for your effort in school and most of all for good behavior. I hope you will all do your best." Maria's heart sank. How could she tell Miss Wilson now? It would spoil her chance of going to camp. Maria stood up slowly. The other children pushed past her and rushed out of the door. Maria began to follow them. Suddenly she turned and ran back to the teacher's desk. "Miss Wilson," she said, "I have to tell you something." What will Maria tell her teacher? Will Maria finally tell Miss Wilson the truth about the list? Don't miss the next exciting chapter in the story of Steven and Maria!